Description: Lumber disc prolapse/ sciatica is considered a difficult to cure disorder. Even if pain can be subsided using prolonged bed rest or pain-killers, almost 90% of the cases see a recurrence/relapse in just a few months of relief using these traditional treatments. Surgerical treatments have also not shown satisfactory results. 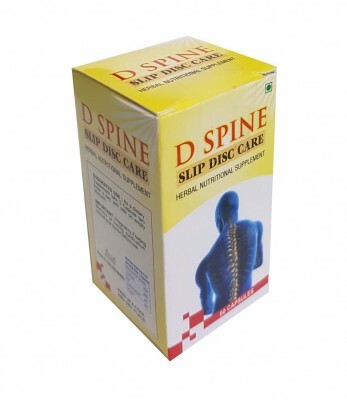 Our concoction, D-Spine is a Herbal Nutritional Supplement that has shown significant clinical improvement in treatment of Sciatica & Lumber Disc Prolapse. Based on AAY Herbal's method of backing Ayurvedic formulations with scientific research and allopathic validations for best results, this product is uniquely prepared, extremely effective and unlike other products available world-over.